Foster initially moved to Balderton. He died at Gonerby Moor in 1891. Henry died at Gonerby Moor in 1879. Mary Ann married John Glossop in 1859. 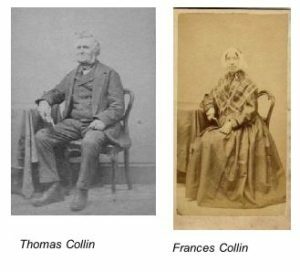 In 1861 they were at Littlegate Farm, next to Mary Ann’s brother William Collin. They later moved to Gelston. Frances married John Squires, son of William and Mary Squires in 1867 and they settled at Gelston Grange. When John died in 1907 their son Henry Squires took over Gelston Grange and continued there until at least the 1930s. Sophia married George Footitt from Great Gonerby 1874 and later moved to Donington, nr Spalding. She died in 1903. John stayed at Loveden House. He married Louisa Northing in 1879 and took over the farm when his father died in 1885. He seems to have moved to Gelston around 1903. He died Gelston in 1934. Thomas Collin was born 1864 at Littlegate Farm. In 1905 he was living at Gelston Manor when he married Florence Marian Milington at Dry Doddington. She was the eldest daughter of Robert Millington of the Wheatsheaf Inn. Charles Collin was born in Claypole in 1889. 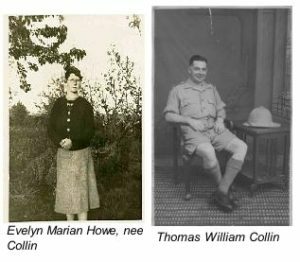 His mother Catherine Birch Collin was unmarried; she married Joseph Dawson Towell 3 years later. Charles was bought up by his grandparents John Pepper and Anne Collin (nee Birch) at Claypole Watermill, where John was an agricultural labourer working for Mr Arnold. The grandfather drowned in the River Witham in 1906 (see press clipping). His grandmother moved to Barnby Lane where she received Charles’ medals in 1922; she died the following year. 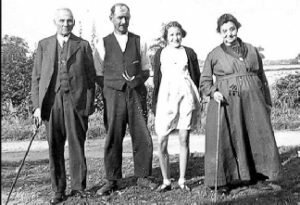 In 1911 Charles was still living at the Watermill, but staying with Fred & Elizabeth Bellamy and working as a farm waggoner (Fred was the farm bailiff).